The children have learnt about plants in school, but there was no hands-on activity on planting in school, so I thought it would be nice if we could do it at home. To be honest, I have zero experience in gardening. Perhaps growing beans on cotton wool would be the simplest "gardening" that we can do at home. The setup is super easy. I bought a packet of mung beans from supermarket. We placed a few pieces of facial cotton wool in a plastic cup, put some mung beans on the cotton wool, and added some water just enough to dampen the cotton wool. Then we placed the setup next to the window. For the next few days, we observed and took photos on the growth of the mung beans. Oh well, as I was saying that this is the simplest "gardening", it seems that I simply do not have "talent" in it. Out of about 18 mung beans, only one of them grew! I think the others were unable to grow due to mold. 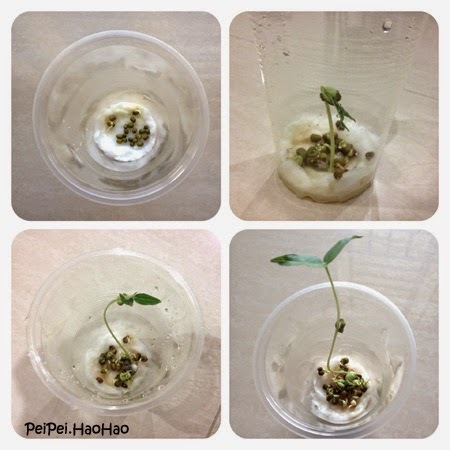 This is not just a simple science experiment, it is also a good opportunity to teach the children about responsibility - they are to take good care of the plant. I had to remind them to add water to the plant for the first three days, then for the next few days, they remembered to do it without my reminder. Oh, what did we do with the remaining mung beans? We had dessert - mung bean soup (green bean soup). Read our recipe here. Do you have any interesting way to teach children about plants? That is so interesting. How did you come up with that? My kids need to learn a thing or two on responsibility and how to take care of something. They barely know how to take care of themselves. KG, my children are also learning along the way. I think it is important to instill the value of being responsible since young age. I had no idea beans could grow without dirt. AWESOME post! Thanks for sharing!!! Lisa, thank you! It is really simple! Good idea for growing beans.